They’re in my Flickr stream anyway, but here are the best of the photos I took this morning out in Golden Square of the eclipse. 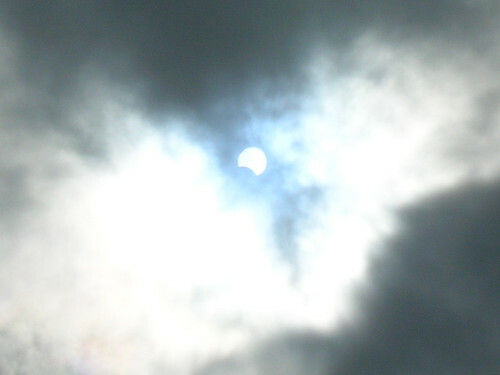 I’m pretty pleased with the results considering the lack of proper equipment and heavy cloud cover. 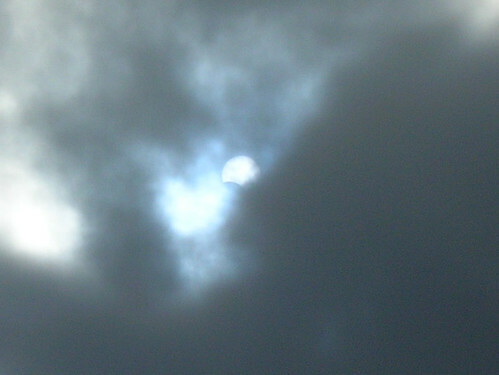 The maximum magnitude of the eclipse in London was only 16.8% at 11:33 BST and, as you can see, the sky was pretty cloudy. 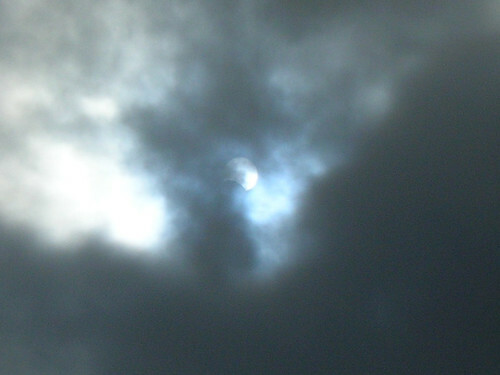 I had to wait quite a few minutes before a sudden opening in the clouds allowed me to glimpse the eclipse. This shot was achieved simply by pointing by Nikon Coolpix straight at the sky with no filter. It’s probably the best of the three decent shots I managed to get. I’ve kept my mylar glasses from a nice little book I bought around the time of the 1999 eclipse produced by the Royal Greenwich Observatory. I dug the book out the glasses were unscratched so still safe to use. 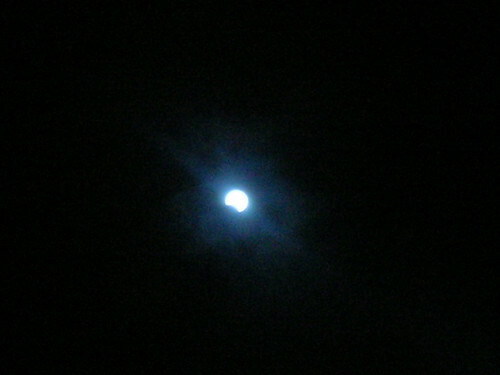 In between taking photos, I used them to observe the eclipse with my own eyes rather than via my camera’s LCD. Then I simply held the glasses plush to the camera’s lens, and of the ten or so photos I attempted, this was the better of the two that actually worked. This was in fact the last photo I took before cloud cover came in and didn’t look like lifting. So Easter Island in 2010 perhaps?